TOPIC: Reunion. Military mail WWII. In 1939, with the war imminent, troops were raised in the colonies to fight alongside soldiers from the metropole. In all, 3354 volunteered or were conscripted and were called upon to leave the island. Of these, 1500 were landed in Madagascar and never made it to France. The remainder travelled in bad conditions and reached Marseille with 9 dead and 147 requiring hospitalisation. After the Armistice in June 1940 the decision was taken to repatriate the colonial troops and the Armée d’Afrique that had not been taken prisoner.This was easier said than done as there were very few means of transporting them available and the majority remained in transit camps such as that at Cäis and Fréjus. The complex letter shown here and detailed below highlights the difficulties in locating a soldier and the action taken by the military and postal authorities. This is an undated letter (January 1941) sent from a soldier in Réunion to a relative, an artillery gunner in France. 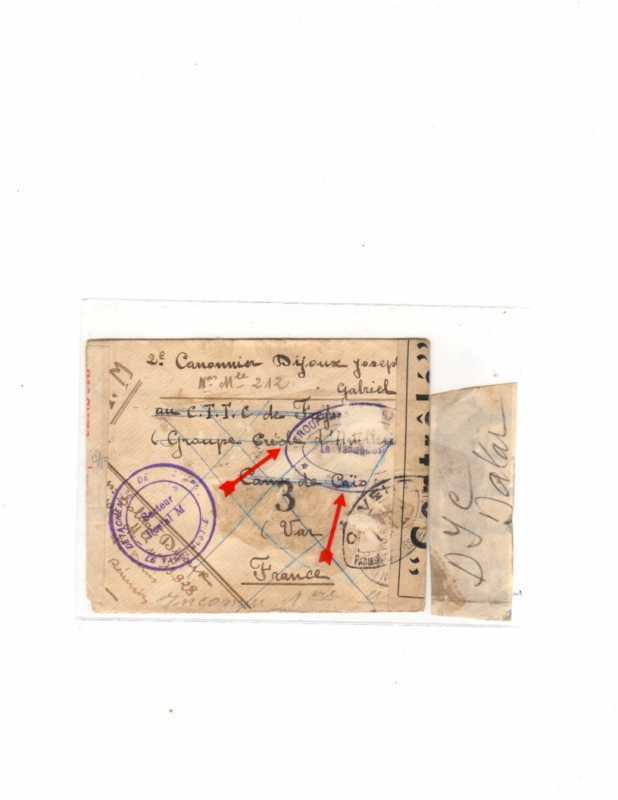 It is sent under franchise, authorised in Réunion with the incomplete handstamp “Détachement de…./Secteur Postal M / Le Vaguemestre” It is addressed to 2nd gunner Joseph Dijoux at the Campe de Transit des Troupes Coloniaux (CTTC) at Cäis ,Var. •	Sontay Sailed from Tamatave on 23 January 1941 and was stopped by the South Africans as it approached the Cape on 25 January. •	Ville de Strasbourg Sailed from Diego Suarez on 28 February 1941 and was stopped by the South Africans on the 2 March. The ships were taken into South African ports and the mails censored at Durban. The mails were taken on eventually by British or neutral vessels and reached France in August 1941. They established that Joseph had been repatriated on 10 January 1941 on ss Marigot. 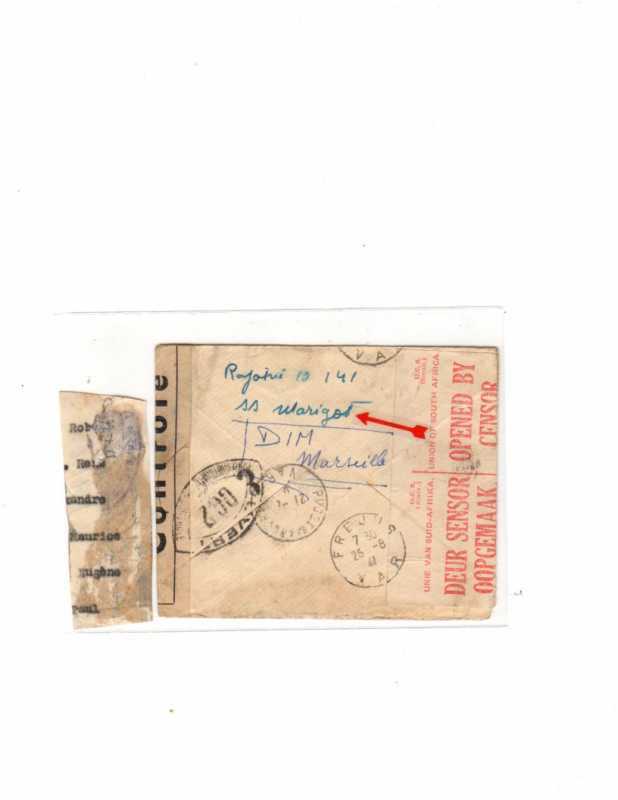 The slip attached to the letter (detached by a previous owner) is marked DIC Dakar. (Direction de l’Infanterie Coloniale ?) However, the last ship that sailed for Madagascar and Réunion left on 12 September and got no further than Dakar. In the absence of any further transit marks, the supposition is that the letter remained in suspense at Marseille until postal communications were re-established. Note: The analysis of this letter could not have been completed without the help given by Jerôme Bourguignat and particularly Jean Goanvic both of the Académie de Philatélie. Last Edit: 4 weeks 16 hours ago by prakelly.